From home decorating to garden and kitchen tools, wine jugs can be used for more than just holding wine. Reuse the jug for any number of craft projects, and create useful art that will last. Pick a jug craft project that takes minutes, or one that takes focus and planning, but whatever you choose, have fun. 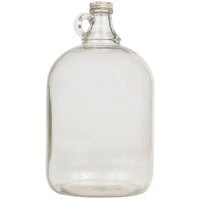 Use a glass cutter to divide the wine jug into top and bottom. The bottom, once the rough edge is sanded, can become a large glass bowl. Lay a clean, decorative dishtowel in the bowl, and it's ready to hold fruit, onions and candies. The top can become a garden cloche. Cloches fit over outdoor plants to protect them and hold moisture in. They are especially useful for seedlings that are just getting established and vulnerable to hungry animals and clumsy human footsteps. Turn a wine jug into a lit-up centerpiece or an ambient side light by packing it with white or colored Christmas lights. If you drill a small hole in the bottom, you'll be able to run the electric cord for the lights more subtly from the bottle to the wall. You can create a hanging light with the jug, too, by drilling two extra holes in the bottom, and hanging the jog upside-down from the ceiling with a chain. For the lazy crafter, no drilling is necessary: Let the cord come out of the jug's mouth and hang the jug from its handle. Add a splash of green to your bedroom, bathroom or any of the main areas of your house by creating a terrarium inside the jug. Filled with dirt, small plants and whimsical decorations, this repurposed wine jug will become the gem of any windowsill. Use a wire hanger to place plants, baubles and small statuettes into the jug. Bend copper wire into a stand so that a jug on its side doesn't roll away. Use a kiln to slump the glass jug, and use it as a serving tray. Perfect for wine and cheese parties, a glass tray that is obviously made from a repurposed wine jug will attract the admiration and curiosity of your guests. For added interest, put small bits of colored glass into the bottle before you slump it. You can also use a mold to slump the jug into a dish with curved-up sides, perfect for serving wet foods like olives or fruit slices.